Winix Inc. has been proudly developing air purifying products for more than 40 years. The mission behind each air purifier they manufacture is to design a high-quality machine that produces the cleanest air possible while at the same time sustain a comfortable living environment. Take a look at the links below to learn more about each series and discover which model may be right for you. For many years, Winix has made a name for themselves by offering a 3-stage air purifier that utilizes a specialized, patented PlasmaWave technology. This feature works similarly to an ionic generator by neutralizing airborne bacteria, viruses, and odors, but doesn’t produce harmful ozone. 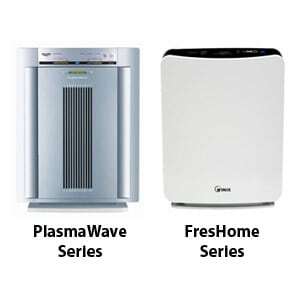 The original product line of air purifiers that fall under this category was called the PlasmaWave Series and includes these models: WAC5300, WAC5500, and WAC6300. You can tell these devices apart from other Winix products by their silver and black colored casings. We consider the WAC5500 as the best air purifier for dust control and the best apartment air purifier for studios and lofts. Within the past few years, Winix has introduced a new FresHome Series. This series operates with the same 3-stage air purification process as the PlasmaWave Series, but has an updated style and a few additional features. This model of air purifiers has a white casing and the design is much more modern. Models under this line include P150, P300, and P450. These two series of air purifiers by Winix offer additional layers of air purification by using an advanced 5-stage air purifying process that also includes PlasmaWave technology. Both series remove the broadest range of harmful airborne contaminants and are excellent at getting rid of allergens, dust, smoke, pet dander, mold, bacteria, viruses, and chemical vapors. 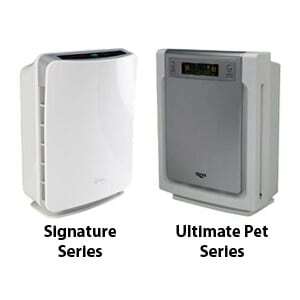 Similar to the PlasmaWave Series mentioned above, the Ultimate Pet Series is the original line of air purifiers in this category and include these models: WAC9300 and WAC9500. To date, it’s the top air purifier for cat and dog hair and dander. The Signature Series is the newest version of this line and comes with an updated look and feel. Models in this series include U300 and U450.